Why is the heartland of the United States experiencing such a horrific drought right now? At the moment, approximately 61 percent of the entire nation is experiencing drought conditions, and this is absolutely devastating farmers and ranchers all over the country. Less than two weeks ago I wrote an article asking what would happen if these drought conditions persisted, and now we are finding out. The U.S. Department of Agriculture has created the largest natural disaster area in U.S. history. The USDA has declared 1,016 counties in 26 U.S. states to be disaster areas. The USDA declaration basically covered about half of the nation, and there is now no denying how horrible this drought really is. You can see a map of this disaster area right here. 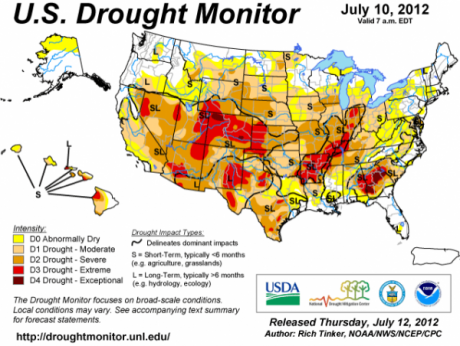 This endless drought is being compared to the nightmarish drought of 1988, and if it persists into August it could become perhaps the worst drought that America has ever seen. 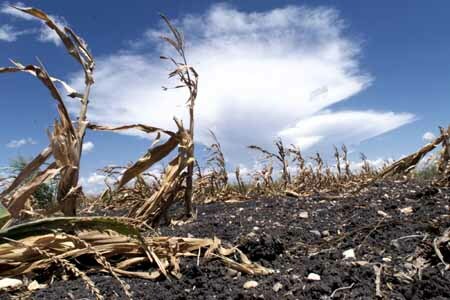 The USDA says that approximately 60 percent of all corn in the country is experiencing "moderate to extreme" drought conditions. If this drought does not end soon, the losses are going to be mind blowing. Already, it is estimated that farmers and ranchers have suffered billions of dollars in damage. How much worse can things get? At the beginning of July many were hoping that we would soon see some rain and that we could still see a decent corn harvest. The whole of Iowa was classified as abnormally dry as of July 10 and 12.7 percent of the top corn and soybean producing state was in severe drought, up from 0.8 percent the prior week. Harder-hit Illinois, the No. 2 corn and soy state, was 66.28 percent under severe drought or worse, up from 40 percent the previous week. Severe to exceptional drought covered 80.15 percent of Indiana, versus 68.84 percent the prior week. Conditions in Missouri also deteriorated, with 82.54 percent of the state in severe drought or worse, compared with 78.83 percent the week before. 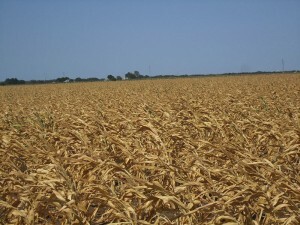 It is being projected that in some of the major corn growing areas as much as 60 percent of the crops could be lost. "Corn is anywhere from knee-high to waist-high," Gonzalee Martin, agriculture and natural resources educator with Purdue University's Allen County extension office, told The News-Sentinel. "Much of it has already tassled with no ears at all. Much of it's going to be completely lost"
Now, as punishing drought grips the Midwest, Villwock, 61, walks his hard-hit 4,000 acres in southwest Indiana in utter dismay. Where there should have been tall, dark green, leafy plants, there now stand corn stalks that are waist high or, at best, chest high. They are pale in color and spindly. Fragile. Tired. Pull back an ear's husk and you find no kernels, he says. With temperatures rising above 95 degrees, the pollen starts to die. "It's emotionally draining," he said. "The crop got out of the ground very well. We were so optimistic. But maybe a few of us were counting our eggs before they were hatched." So is there any hope that things are going to turn around? AccuWeather.com agricultural meteorologists are concerned that new and frequent waves of near-100-degree temperatures and stingy rainfall will further stress crops over Iowa, Illinois and Nebraska into mid-August. Evaporation rates are very high into the first part of August. Soaking rain on a regular basis instead of a brief downpour is needed to be of benefit beyond a couple of days. Turning things around in the Midwest as a whole will be a difficult task as dry ground tends to bring higher daytime temperatures, which in turn raises evaporation rates and so on. So what does all of this mean for the rest of us? It is going to mean higher food prices. On Friday, the price of corn hit $7.50 a bushel. It had been thought that the price of corn would only be about $5.00 a bushel this year. At this point, the price of corn is up 48 percent since mid-June, and it could go a whole lot higher. Some analysts are projecting that if this endless drought persists, we could see ten dollarsfor a bushel of corn and 20 dollars for a bushel of soybeans. And yes, you will notice this at the supermarket. This endless drought is also a complete and total nightmare for ranchers. At this point, approximately 50 percent of America's pastures and ranges are in "poor" or "very poor" condition. Back in June, that figure was only sitting at 28 percent. So things have gotten a lot worse very quickly. Rauhn Panting, with the University of Idaho, who works with ranchers and farmers, says, "We're going to run out of grass. It's going to be scary." Ranchers are being advised to vacate grazing lands, weeks and even months before when they usually have to leave. Left with only two choices, feed or sell, many are opting to sell their cattle. The Torrington Stock Market in Wyoming, has recorded that 36,000 cattle were sold in May and June of this year. The usual average for these months is 5,500. Small ranchers, with 30-50 cow/calf pairs, are being hit the hardest. So expect higher meat prices in the fall and winter as well. This all comes at a really bad time. We are already on the verge of a global financial catastrophe. Agriculture was supposed to be one of the few bright spots in the U.S. economy. Sadly, the U.S. is not the only one having problems with crops this year. For example, in Germany farmers are actually experiencing a full-blown plague of rats. Millions of field mice are overrunning the central German states of Thuringia and Saxony-Anhalt, much to the concern of local farmers. The rodents are devastating food crops, cutting yields by up to 50 percent. Getting birds of prey to hunt the critters didn't help, and now farmers want to be allowed to use a banned rat poison.